This is the fourth in N.J. Cooper’s series of whodunits featuring intrepid, headstrong forensic psychologist Karen Taylor and the two toothsome rivals for her affection, chunky Charlie and winsome Willie – aka D.C.I. Charlie Trench of the Hampshire Police Major Crimes Team (broad, dark, leather-jacketed, fiery, Northern) and Mr (if you please) Will Hawkins, leading brain surgeon (sinewy, blonde, cashmered, OCD, Southern). The book opens with Karen hurting her foot ­– fans of the series will know that our Karen regularly demonstrates her intrepid headstrong nature by injuring some part of her willowy anatomy. In this case the culprit is a shard of glass from smashed French windows in her apartment: cue writerly comparisons with the glittering diamond ring Karen recently eased off her finger when Will mysteriously broke off their engagement. Blood-smeared at the scene of the crime, fingerprints all over the shop, is Sheena Greves, Sir Dan’s ‘personal press officer’, who claims to have lost her memory. Karen’s task is to establish whether Sheena really is suffering from post-traumatic amnesia or simply faking it. It soon emerges that Sheena’s job description also includes shepherd’s-pie-cooking, bath-running, slipper-warming and giblet-tending for Sir Dan in a secret wee love-nest in London. Is she a bitter mistress harbouring the eponymous ‘vengeance in mind’? Or an innocent sap set up by a cunning evil genius? Now it just so happens that our Karen’s latest academic research project involves post-mortem mutilations (her day job is university lecturer). Why do some murderers indulge in additional butchery after the heady adrenaline of the chase and kill is spent? Simple necrophilia? To assuage residual anger? To revel in acts they’d never dare perform on a live body? Whatever the reason, Karen knows that the results of any mutilation are always either displayed or kept as trophies – not plonked unceremoniously in a pedal bin. So although evidence keeps stacking up against the amnesic Sheena (the heavy-duty upholstery equipment discovered in her attic, for example, would hone the requisite upper-body strength for Sir Dan’s Sabatier crucifixion), our Karen is convinced of her innocence. 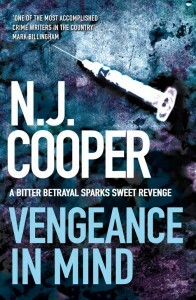 Prior to this novel, I hadn’t come across N.J. Cooper’s work, but apart from an overextended and overwritten run-up and a few clunky backstory expositions, it does everything a good crime novel should do. The murders are creatively gruesome; the clues and red herrings nicely paced; the twists and reveals satisfyingly complex; and the psychological musings of our heroine, backed up by (I assume) bona fide academic literature, provide an additional intellectual dimension. The longer story arcs linking this to previous books in the series are both entertaining and involving: the will-they-won’t-they sexual tension between Karen and the Neanderthal Charlie; her on-off love affair with squeaky-clean control-freak Will; the Edina-esque awfulness of her venal advertising exec mother; the island cottage renovation Karen can’t afford… all create an ongoing drama just crying out to become a TV series.